I have been looking forward to the Memebox Zero Cosmetics box for SO long now. Probably months, right? One thing I really love about Korean cosmetics is that when they say it's natural, they really mean it. It's like getting honey right out of the hive and slapping it on your face. Or squeezing aloe out of the plant smack into a jar. That kind of natural. 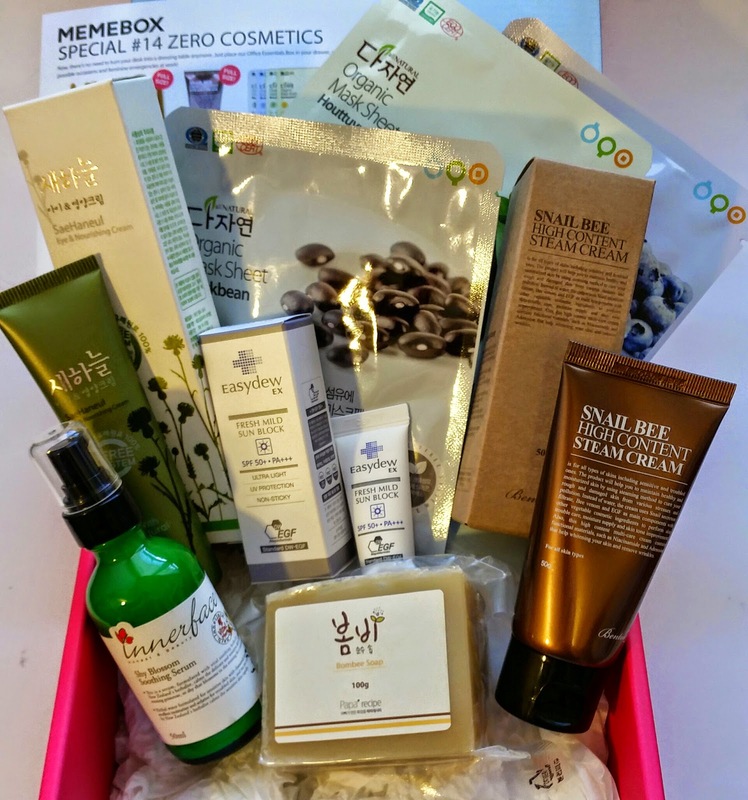 Memebox is a Korean beauty box company that curates boxes around a certain theme and sends them to your door. These are not subscription boxes. You can buy the exact one you want, you can buy ten, you can buy none and just get items directly from their shop. The fun of a Memebox is that while you may have a rough idea of the theme, you have no idea what's actually inside. 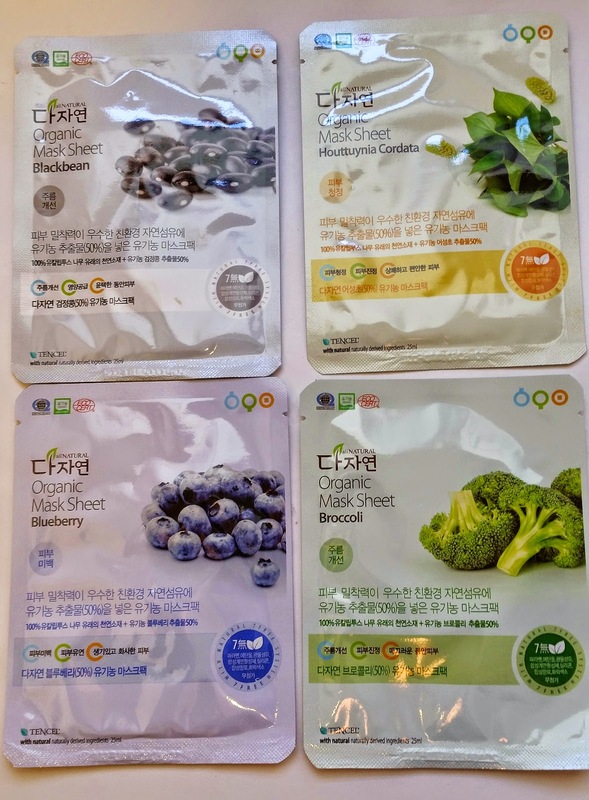 What You Get: The original Memebox comes packed with 4 - 8 full sized products and deluxe samples, carefully curated from Korea to give you the best experience and widest exposure to a range of products. "Zero alcohol, zero parabens, zero DEA and zero Formaldehyde, this is the ultimate zero chemical Zero Cosmetics Box! We did some studying to create this zero chemical, zero additives, Zero Cosmetics Box! We wanted to provide you with the most natural and chemical free head to toe care so that you don’t have to put any more unnecessary additives and harsh ingredients that will cause irritation! We’ve loaded up this box with only the most gentle and natural products so that you can maintain your natural beauty." Innerface Shy Blossom Soothing Serum-50ml- Aloe Vera and Lavender Oil work to soothe irritated or sensitive skin and the hyaluronic acid and sacha inchi oil deliver instant, intensive hydration. This herbal formula contains chamomile water, tea tree water, sweet almond oil, evening primrose oil and olive oil. Use after your toner and pat serum onto face with hands. Well, I'm bummed because I'm pretty sure the lavender content in this is going to be too much for me to handle. This product is vegan, cruelty free, PEG free and paraben free. Benton Snail Bee High Content Steam Cream-50g- This cream has snail secretion filtrate, hyaluronic acid, argan oil, EGF, and squalane. It works to brighten and nourish your skin as well as treat signs of aging. This is to be applied last in your skin care routine. So this has some great ingredients! Say what you will about snails, the hyaluronic acid is a fantastic ingredient that I think every moisturizer should include. Because of the oils in this moisturizer, it really does need to be applied last. Oil creates a barrier for your skin which is good because it keeps your skin moist but it also prevents anything else from getting to your skin, too. Bolded ingredients make me happy. They're high up on the list, too. I will be using this! This makes up for the disappointment of not being able to use the Soothing Serum. Nature's Friend SaeHanuel Eye and Nourishing Cream-40g- This cream is enriched with 10 different organic plant extracts for delivering deep nourishment and facilitating skin regeneration. Apply after your toner along your eye contours and rest of your face. Contains no parabens, ethanol, mineral oil, silicon, or synthetic dyes or fragrances. Lucky for me, I google translated the ingredient list I found and there is no lavender! There's a whole lot of vegetables, along with some jojoba oil, squalane and beeswax (way at the bottom). Easydew Fresh Milk Sunblock SPF50++-7ml- This is gentle, ultra light and greaseless. It provides a high level of sun protection and helps maintain moist skin. Apply this at the first stage of makeup application. The sunscreens used are: Ethylhexyl Methoxycinnamate 7.5%, Titanium Dioxide 4.25%, Ethylhexyl Salicylate 2%, Octocrylene 2%. I personally prefer a straight up Titanium Dioxide and Zinc Oxide sunscreen but that's just me. The use of any sunscreen is better than none, that's for sure. Huttuynia Cordata and it's a plant we call Bishop's Weed. It's been used forever in Asian medicine for its antiviral and antibacterial properties. I'm surprised they didn't put it in the Herbal Memebox. I can't find these anywhere. I should learn Korean. 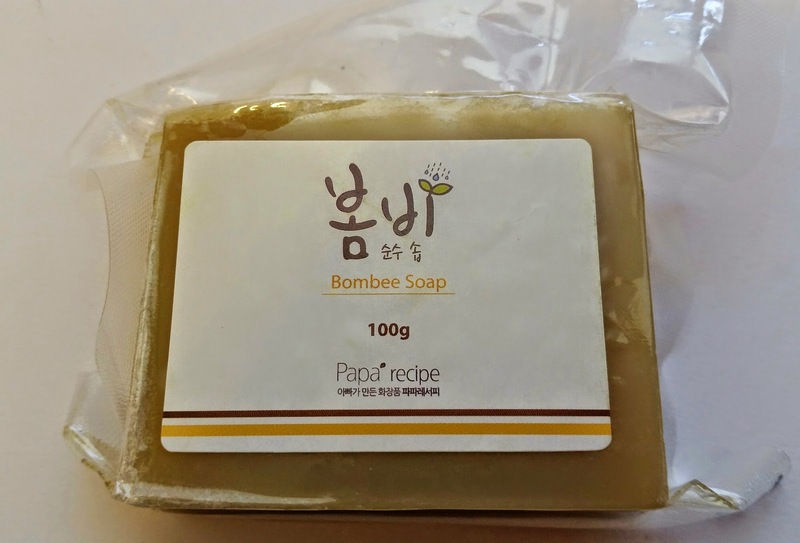 Papa Recipe Bombee Soap-100g- Last but not least, we have a chunk of soap! I want more of it already. It's made from propolis, honey extracts, jojoba oil and citron seed oil. This is perfect for irritated, sensitive or acne prone skin. Honey is a wonderful natural antiseptic. I think I want to spread the love and use this in the shower, not just as a face soap. VERDICT: I love this box! Love it! I love getting four masks. I love the soap. 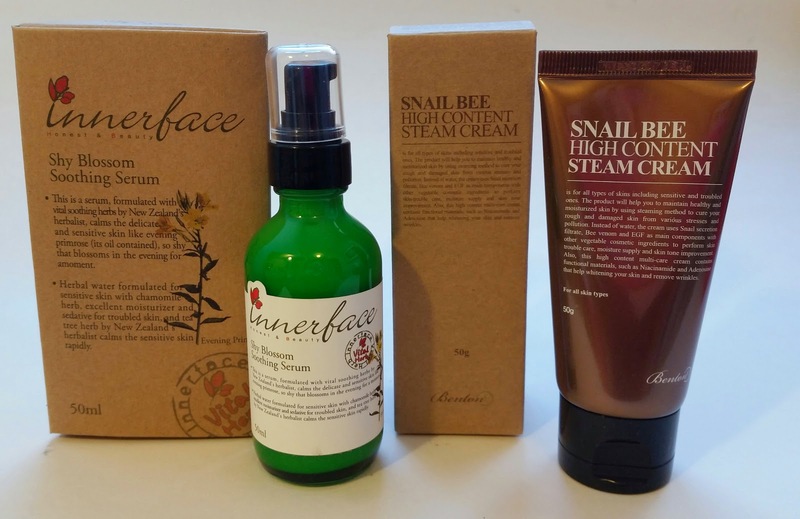 I adore the ingredients in the Benton Snail Bee Steam Cream. 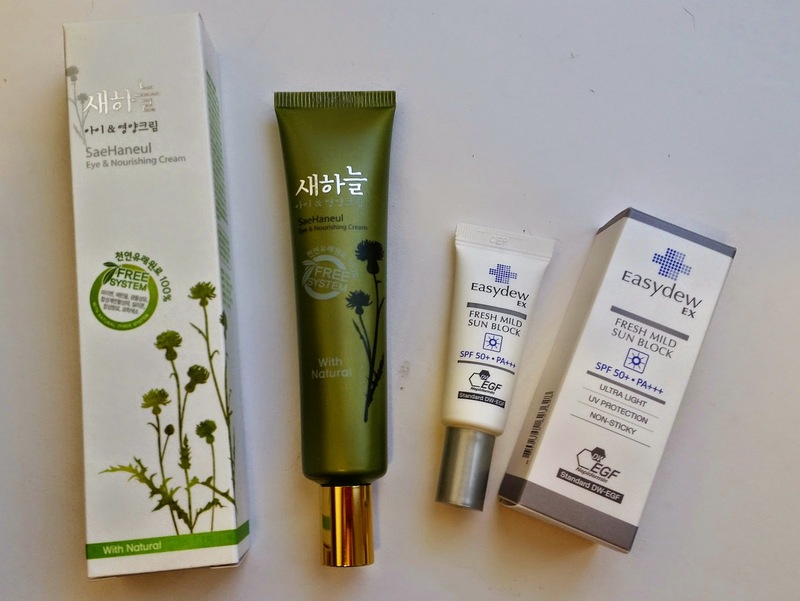 I'm disappointed I can't use the Innerface Soothing Serum but that's not Memebox' fault. I probably won't use the sunblock but the Nature's Friend eye/face cream sounds interesting. I like this box so much that if they release a Zero Cosmetics 2, I'm getting that one, too. DON'T FORGET TO ENTER MY MEMEBOX GIVEAWAY! Enter for a chance to win one of three Memeboxes! I'm glad I ordered this one. I will use everything even the serum so I'm happy! I've heard really good things about that steam cream so I'm excited to try it out. I'm so happy, too! I almost didn't get it but then with a coupon code I just couldn't resist. Now I'm really glad I did it. I think the Steam Cream totally makes this box but everything else is so good, too. Definitely one of the best Memeboxes yet! That's really a great box. Although I had some bad experience with Benton Steam Cream (in the old packaging), I know that a lot of people like this a lot so it is great to have it included. The other products look very nice, too. This looks so great. I wanted this one but it sold out before I could get it - got to be quicker next time.